Live it! 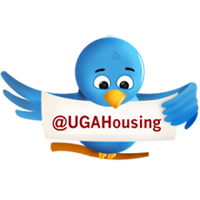 UGA Housing: Takeover Tuesdays! We know Takeover Tuesday is not a new idea, but it's such a great way to show the diversity of experiences in University Housing, we thought we'd give it a try! 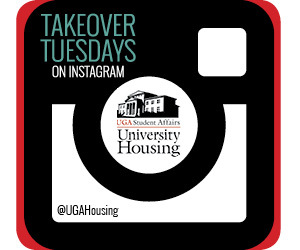 So, in an effort to expand our own content on and showcase those authentic student and staff experiences, we're hosting Takeover Tuesday on our UGA Housing Instagram account. Follow and engage as we feature both professional and student staff members as they work to make University Housing communities comfortable, affordable and secure while supporting residents academic success and personal growth. See what's happening @UGAHousing on Instagram. Great food and great people with awesome styling and interior. Also a great venue Houston for cheap happy hour drinks. However, the downstairs beer selection is about as standard as it can be while upstairs can be a bit more creative. If anyone knows someone looking for an apartment in Athens, we have leased a room at The Standard and need to get out of it. Let me know if you are interested and can help get Megan out of this lease! We are willing to pay $200 off first months rent!